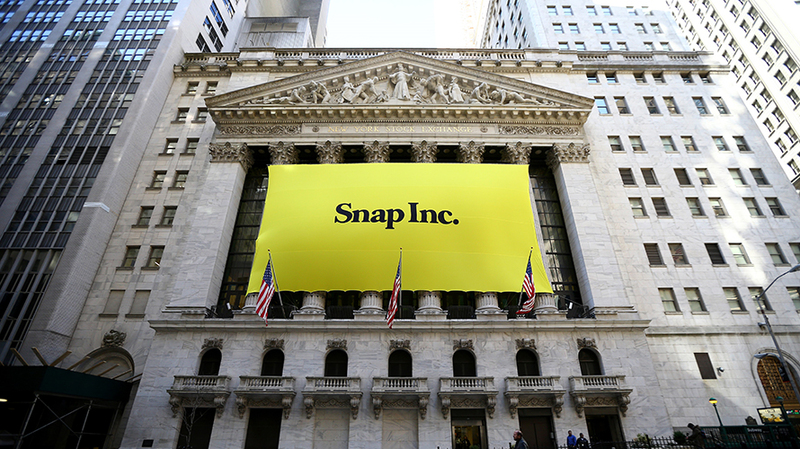 Snapchat went public today with a valuation slightly above analysts' expectations. With Snapchat parent company Snap Inc. going public today, analysts everywhere have weighed in with forecast and think pieces. But what about its potential for future client work? We spoke to three digital shops for their takes on the platform. Facebook’s decision to imitate some of Snapchat’s key features with new launches like Instagram Stories has undoubtedly slowed user growth. Instagram is also an easier sell for brands already on the platform as Snapchat presents a higher barrier to entry along with some logistical concerns regarding its ad formats. Huge, which used Snapchat to support Audi’s Super Bowl push way back in 2014, sees it as a “strategic” platform that allows brands to be more playful because it presents less exposure and therefore less risk than the “evergreen” Instagram. Despite attracting some older users recently, Snapchat’s primary value to brands remains its ability to reach a younger audience. “Snapchat is still the leading camera platform for capturing and sharing liked moments, which is what younger consumers have been trained to do as it relates to interacting with social media,” said Jessica Clifton, U.S. managing director of strategic growth and development at Edelman. The firm has been working with Snapchat since its inception, noting particular success in utilizing geofilters for Hilton and launching campaigns for Starz and Dole. The former effort used a Sponsored Lens to promote Season 2 of Ash vs Evil Dead, leading to 22.5 million incremental earned views and a 12 point favorability boost among Snapchat users under the age of 25. For Dole, Edelman launched a “racing experience” featuring three influencers wearing branded Spectacles while racing go-karts. Fans picked racers and challenged friends while the influencers sported Dole T-shirts and ate Dole products before and after the race. Clifton said the platform is not right for every brand, calling Discover features “fantastic for publishers” and claiming that she would “recommend Snapchat in a second” for a youth-focused client like Activision. Resource/Ammirati first used Snapchat two years ago for a specialty retailer looking to attract younger consumers. The brand built its presence on the platform over a year via Snapchat Stories content integrations, using small-scale influencers to reach an organic audience of about 7,000 before switching to paid promotions last December. Many clients, however, remain skeptical of Snapchat as a viable paid media platform due to both increased scrutiny of social media budgets and the advent of Instagram Stories. “There aren’t a lot of positives there for us to say it’s the right move for a client,” said Resource/Ammirati executive director of strategy Greg Moss, noting that Instagram is easier to navigate and comes with the added benefit of access to Facebook’s data structures. Moss said that Snapchat still has value, particularly for testing a product theme or experimenting with Discover (which has no Instagram equivalent). He cited a QSR client that recently moved some of its TV budget into a scripted content program targeted, again, to younger users. Saldarriaga thinks Snap’s future depends on finding out “how to have a branding message that could only live on Snapchat that Facebook won’t try to copy,” citing Lenses as the prime example.